Barbecue sauce has become an overpowering condiment for dipping fried bits of something that might be chicken. Down in the Carolinas, barbecue sauce is something to enhance smoked meats (pork). 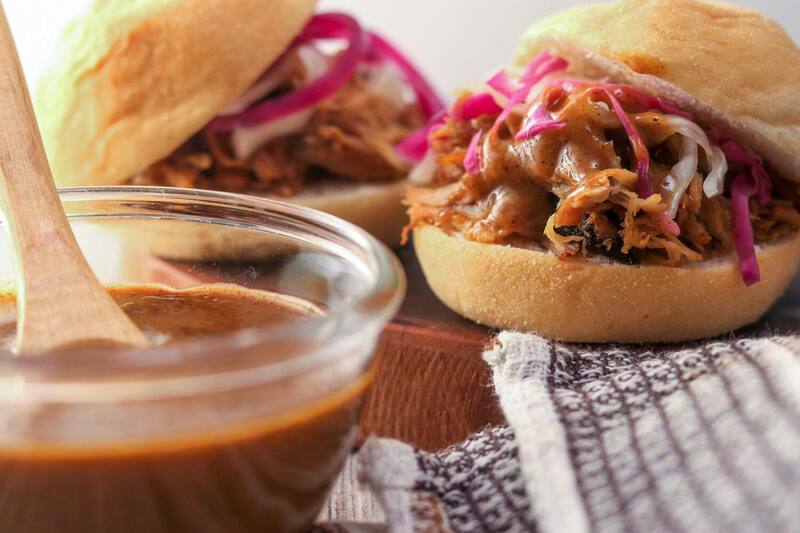 These pulled pork barbecue sauces are not what you typically find in the grocery store. That's because these sauces are actually good and perfect for the most traditional of barbecue. 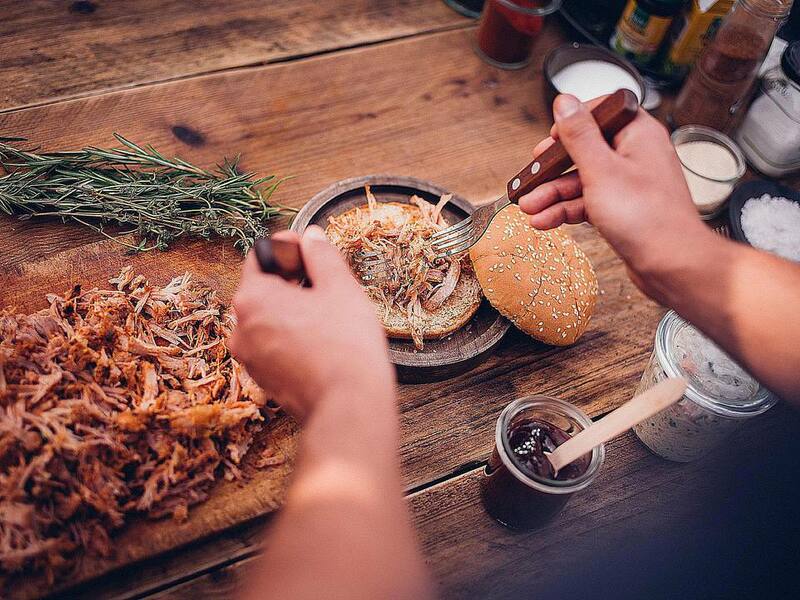 Pulled pork sauces are frequently optional, but how you apply it is up to you. The sauce is never added while the pork is cooking, but after it is pulled. You can add the sauce to the after you shred the meat, pour it over before you serve it, or let the individual decide if and how much they want. This Big Daddy's Carolina-style barbecue sauce is a variation on a classic mustard barbecue sauce. The combination of savory mustard flavor with sweet sugars added to a touch of smoke flavor makes this a great general pork sauce. This sauce recipe has a lot of flavors: put this one on the side and let people decide how much they want. Memphis barbecue means pork, and this tomato-based barbecue sauce is equally good on pulled pork as it is on ribs. This Memphis barbecue sauce is not a traditional Carolina sauce, but it is a great barbecue sauce. What makes this sauce perfect for pork is the balance of vinegar to tomato. This gives it that tangy flavor that works so well with any kind of pork, grilled or smoked. This best odds pulled pork sauce is a simple pulled pork barbecue sauce that calls for ingredients you probably have in the kitchen. While simple, this barbecue sauce adds that perfect vinegar tanginess that makes pulled pork so good. This is the kind of sauce you want to mix into pulled pork as you shred it. If you want to add some heat try increasing the amount of cayenne. In the Piedmont area of the Carolinas, barbecue sauce starts with vinegar but gets a touch of tomato to give it an extra savory flavor. This Piedmont barbecue sauce is very much a traditional Southern barbecue sauce with the tangy flavor of the vinegar with a little heat and a little sweet. This is a thin sauce that is perfect for mixing into pulled pork as soon as it is shredded. It helps keep the meat moist before it hits the plate or the bun. This is an old recipe for a barbecue sauce that has no tomato or mustard but does contain butter and lemon. A thin and savory sauce, use this Southern vinegar sauce on pork. Because this vinegar barbecue sauce contains butter it is particularly good at keeping the meat moist. In fact, if you have ended up with dry pulled pork, this is the sauce to give it back its moisture. In the south of South Carolina and the north of Georgia, mustard is king. These barbecue sauces never contain tomato and have the savory heat of mustard over the tangy taste of vinegar. This mustard barbecue sauce gets an extra kick from balsamic vinegar which not only adds flavor but also gives this sauce its unique color. There are no rules for barbecue sauce when it comes to pulled pork. This sauce recipe is specifically designed to be put in a bottle and placed on the table when you are serving pulled pork. This best odds pulled pork table sauce is a general pulled pork sauce that relies on vinegar, tomato, and mustard to give your pulled pork the best odds of being great. This classic style Southern barbecue sauce starts with ketchup and then adds a good dose of vinegar to give it the proper tangy flavor. Add to that a little sweet and a little heat plus a lot of savory flavors and this is the perfect pulled pork sauce whether it gets mixed right in or served on the table. This Wicker's BBQ sauce comes from Missouri but still has a lot in common with those Carolina vinegar sauces while also carrying on some of the traditions of Memphis barbecue. Heavy on the vinegar tanginess, this is a savory barbecue sauce with a hint of sweet and a touch of heat.